Rear view car mirrors of the 1950s and 1960s. Homepage. This page: Examples of door and wing mirrors, popular with motorists of the '50s and '60s. External rear-view mirrors - 1950s/1960s. Ever wondered "What type of mirror should my old car have?" and needed to see some examples? This page will take a look at a selection of exterior rear-view car mirrors, typical of those on offer say in the late 1950s and into the 1960s in the UK. This was a time when motorists were - in many instances - still expected to fit their own wing- or door-mounted mirrors. The variety of styles, produced by many different companies, was extensive to say the least, so only a few of the most popular will feature here. Part of the selection process came down to the type of vehicle the mirror(s) were due to be fitted onto. Types designed specifically for saloons, sportscars, and commercial vehicles large and small occupied sales catalogues and accessory shops. Once the type of mirror had been selected, it was then time to decide on which style(s) best matched the vehicle to which they'd be attached, and to an extent the type of use the vehicle would be put to. For instance, if the car owner was an outdoors-type, perhaps planning to purchase a caravan in the not-too-distant future, then perhaps he or she would opt for a type that could be extended. Extending types tended to fall into two camps - those where the head could be slid up and down the mirror arm, a common type to be found on old lorries, or where an extension piece could be fitted between the existing mirror arm, and the head itself. Shown to the right is a mirror sold by Trico - better known for its range of windscreen wiper blades than mirrors. Products from the likes of Wingard, Raydyot, Tex and Desmo will no doubt be familiar to anyone that's owned an older car at some point or other, and examples from each firm will now follow. If you're restoring a car or lorry from this era, and are looking for suitable mirrors to fit to it, then perhaps these images will help with the decision process. To begin with, a range specifically aimed at the owners of sportscars, by Arden. The following single page flyer dates to 1968, and there's no doubting which type of motorist they were targeting their Speed Mirror at. The front cover shows an illustration of an E-Type Jaguar fitted with one of their "bullet" mirrors, while below a driver keeps a close eye on the Jaguar saloon behind him, using his wing-mounted mirror. 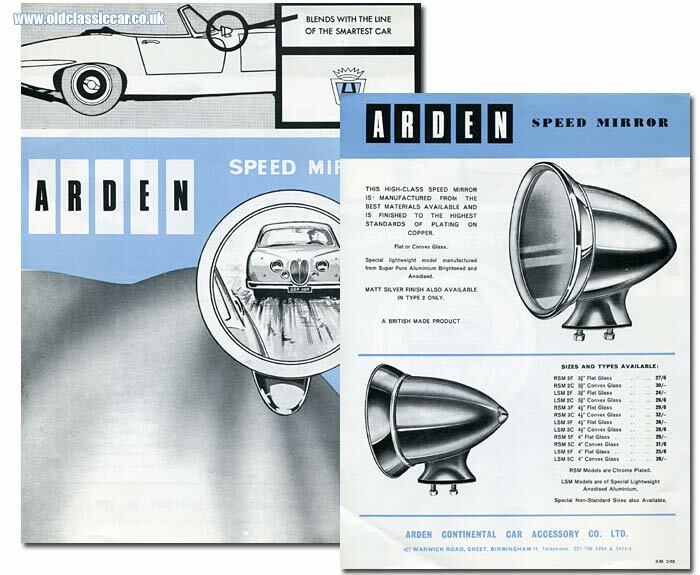 The company's full trading name was the Arden Continental Car Accessory Company Limited. The "high class" Speed Mirror utilised the "best materials available". The chrome-plated RSM versions were finished to the "highest standards of plating on copper", alternatively versions produced from "special lightweight anodised aluminium", and costing a little less, could be specified. Flat or convex glass options were also on offer. Although most types and style of mirror could be fitted to most types of vehicle, the streamlined "bullet" style was aimed squarely at the sporting car owner with his MGB or Spitfire, rather than the bowler-hatted gent in his Armstrong-Siddeley, or P4 Rover. The following styles were probably more suited to their machines. Designs suited to saloon cars. 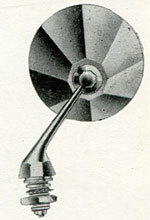 The illustration shown below is typical of the wing-mounted types offered at high street retailers in the mid-1960s, produced by a variety of manufacturers to suit a range of cars and budgets. Some were static, while others - for example Desmo's Boomerang model - were designed to bounce back into position if they were knocked for some reason. The 1960s was something of a transitional time for wing and door mirror design. Whereas older cars tended to look better with circular wing mirror heads, by the 1960s more and more cars - which were becoming more angular in their overall design - tended to suit the "Continental" shape mirror better. Examples of both are shown here, and a key to the illustration follows on. Wingard produced a variety of types during the period that this page is concentrating on. Two of their more stylish car offerings are featured below. The first is the Italian-sounding "Turina", a "continental styled mirror" (ie not circular, it would seem), featuring a spring-loaded mounting and a wide field of view. The second is the "Silverwing", cleverly designed enabling it to be fitted in one of four different configurations, depending on the car it was going on to. Priced at 32/6 each, and fully chromed, they would definitely look the part on most motor-cars. Two of their commercial vehicle offerings are also shown, the lefthand model being telescopic to suit most cab/body layouts, while the righthand example was best suited to vans we're told. Tudor was another manufacturer remembered for its motoring accessories, perhaps most well known of all being their windscreen washer kits. Two of their mirror designs are seen here, the first is a fairly uninspiring "Continental" type, its saving grace being its price of just 16/6 (flat glass) or 18/- (convex). More eye-catching though is the "Tudor Ratchet wing and side mirror". Rather than being a swingback type, this mirror incorporated a lateral adjustment, so that if it received a whack, it just clicks back a few positions rather than snapping off, or swinging around. Another brand well-known in those days but all-but-forgotten now was Tex. Three examples of their products are recalled here, beginning with the stylish "Wideview Viewmaster", a perfect match for the 1960s cars that were in use at the time, incorporating a hood over the mirror itself, and a wide-view Continental head. The second example is a "Tex Continental", with a stylish arm reminiscent of the finned cars of the late 1950s. The third is a "standard" Tex mirror, for which 20/- or 22/6 was charged, depending as usual on whether flat or convex glass was required. Up there with Desmo as perhaps being the best-known manufacturers of car mirrors, was Raydyot. Their range was comprehensive to say the least. The following is just a selection, as listed in a motor trade catalogue from the late 1950s. All being well, a page describing the types of mirror fitted to earlier vehicles will be added to the site soon. A page added in 2017 describes the fitment of Desmo Boomerang wing mirrors, using a leaflet from the 1960s as the source.